Like food trucks before them, street vendors are fighting for the legal right to run their businesses. ALBANY PARK — Following in the footsteps of their food truck brethren, Chicago's street cart vendors are pushing for legalization of their trade. Currently, vendors may sell only raw, uncut produce or prepackaged frozen desserts, with the cost of licenses ranging from $100 to $275. That means tamale stands, "brew hubs" peddling coffee, and even the selling of a cut fruit salad is illegal. A coalition called Street Vendors for Justice has drafted an ordinance that will bring vendors out of the "shadow economy and into the legitimate economy," said Beth Kregor, director of the Institute for Justice Clinic on Entrepreneurship, which is championing the cause. 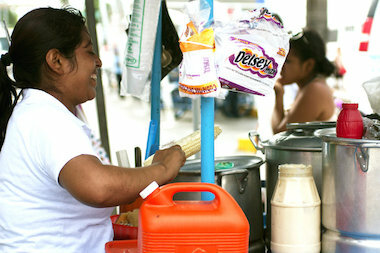 The clinic operates under the the umbrella of the University of Chicago's law school and has been conducting a series of town hall meetings with the Street Vendors Association (more commonly known as AVA, Asociacion de Vendedores Ambulantes) to educate existing and potential street vendors about the ordinance and stir support for the legislation among the general public. Working closely with the city's Public Health Department, the Institute for Justice Clinic has crafted a proposal that takes the city's priorities into account: safe, clean food that's easy to inspect. The ordinance would only allow vendors to sell food that's been prepared and packaged in a licensed kitchen — no cooking would be permitted at the operator's home or on the cart — and maintained at a proper temperature. "Anyone who believes street vendors should be allowed to sell food on the sidewalks of Chicago is invited to join" the coalition, Kregor said. At a forum held recently at Centro Autonomo in Albany Park, Kregor outlined current regulations governing street cart vendors operating outside the boundaries of the Park District (which has its own rules). Claudia Gutierrez, a 21-year-old Humboldt Park resident attending the street vendor town hall while on an alternative spring break with classmates from DePauw University, was surprised to learn some street vendors were committing a crime. "They're what makes Humboldt Park, Humboldt Park," said Gutierrez. "It's one of the things unique about big cities. They're iconic." She said she's eaten from carts on numerous occasions, including elote (a form of corn on the cob), and appreciates the hominess of the food. "The vendors put so much love into it," said Gutierrez. "You don't see a lot of love at McDonald's." If restaurateurs' reaction to the city's efforts to allow food trucks is any indication, there may be pushback. In the case of food trucks, owners of established restaurants argued that such mobile food services were unfair competition because of their low overhead. Many street food vendors are members of Chicago's Latino community, and while their reasons for operating a food cart vary, economic considerations are typically the driving factor, according to Vicky Lugo, vice president of AVA, which mostly operates out of the Little Village neighborhood. "For some, it is the only way that they can support their family. Others are mothers who have husbands but need an extra income and also that flexibility of being able to take care of the kids and the house," said Lugo. "Others, it's a tradition because where they come from. They sell these products, so they come here, and that's the only thing they know. It's not, 'Oh I'm going to become a street vendor because that's cool.'" Street cart vendors were originally included in the ordinance that regulates food trucks but were ultimately dropped from the legislation, Lugo said. Following that disappointment, vendors are excited about the renewed prospect of gaining legal status, she said. "They are exhuasted. So many years they've lived like this, so many years they've had to deal with the police, city inspectors and whatever," said Lugo. "They're just tired of having to wait for a license. They want to live without that fear of, 'Am I going to be ticketed today? Am I going to be harrassed today?'" Kregor said her group "got involved because vendors came to us; they want to be legal." "Vendors all over the city do get stopped. Enforcement is uneven, but all vendors are vulnerable to having their food thrown away, their cart impounded. They have even been arrested," said Kregor. Key to the proposed ordinance would be the availability of shared kitchens, which have faced obstacles of their own. "Our coalition is working to solve the shared kitchen problem as well," said Kregor. "It won't do any good if we pass a law and there are no kitchens for them to operate." The majority of questions raised at the town hall were related to the issue of competition. Food trucks, for example, are required to park 200 feet away from restaurants to avoid the appearance of poaching customers. "We don't think the city should protect restaurants from competition. Our proposal allows carts everywhere," said Kregor, who added that consumers tend to use street vendors for food on the go, not date night. "We don't think the city should guarantee one business succeeds over another. People should be allowed to try," said Kregor. Under the proposed ordinance, she said, established restaurants would also be welcome to operate their own food carts as a way of introducing and promoting their menu items to new neighborhoods. In the same spirit of free enterprise, there's no cap written into the ordinance regarding the number of street cart vendor licenses that could be issued. "If too many people try to sell fruit on one block, they won't last," said Kregor. "If we place a cap, we might be cutting off the best potential vendors." She cited New York City, Philadelphia, Austin, Texas, and New Haven, Conn., as cities that have successfully accommodated street cart vendors in one form or another. "No city that we know of is perfect when it comes to freedom for vendors, but almost every city in the country is better than Chicago," Kregor said. Kregor argues that legalizing street cart vendors would ultimately benefit everybody. "They serve delicious food, they're earning money, they're creating jobs, they're creating an atmosphere that's creative and rich culturally," said Kregor. They're also the most affordable point of entry into the food business, she said. "Some start with an eye toward growing brick and mortar," Kregor said. Next steps for the coalition include rallying existing street cart vendors around the ordinance. Aside from those affiliated with AVA, "It's hard to tell how many there are, or where they are," said Brooke Fallon, community relations manager for the Institute for Justice Clinic. In addition to conducting outreach efforts among vendors, Street Vendors for Justice is soliciting feedback on the issue from the public. Fallon encouraged people to visit the coalition's website, where comments are being gathered via a brief survey. The ultimate aim is to recruit an alderman, or group of aldermen, willing to sponsor the ordinance and fight for its passage in the City Council. "We've met with several aldermen," said Lugo, "and their first reaction was, 'It's not legal?'"